Ultimate bodhichitta A wisdom motivated by conventional bodhichitta that directly realizes emptiness. See Universal Compassion and Great Treasury of Merit. Ultimate nature All phenomena have two natures – a conventional nature and an ultimate nature. In the case of a table, for example, the table itself, and its shape, colour, and so forth are all the conventional nature of the table. The ultimate nature of the table is the table’s lack of inherent existence. The conventional nature of a phenomenon is a conventional truth, and its ultimate nature is an ultimate truth. See Heart of Wisdom and Ocean of Nectar. Ultimate truth The ultimate nature of all phenomena, emptiness. See Heart of Wisdom, Meaningful to Behold and Ocean of Nectar. Uncommon Close Lineage See Kadam Emanation Scripture. Uncommon Whispered Lineage of the Virtuous Tradition See Kadam Emanation Scripture. Uncompounded space Lack of obstructive contact. So called because it is not produced by causes and conditions and so is permanent. Also known as ‘unproduced space’. See Heart of Wisdom. Uncontaminated bliss A realization of bliss conjoined with a wisdom directly realizing emptiness. See Guide to Dakini Land, Tantric Grounds and Paths, and Great Treasury of Merit. Union of No More Learning A union of the pure illusory body and meaning clear light that has abandoned the obstructions to omniscience. Synonymous with Buddhahood. See Clear Light of Bliss, Tantric Grounds and Paths, and Great Treasury of Merit. Union that needs learning A union of the pure illusory body and meaning clear light that has not yet abandoned the obstructions to omniscience. See Clear Light of Bliss, Tantric Grounds and Paths, and Great Treasury of Merit. Unobservable compassion See Great compassion. Unproduced space Lack of obstructive contact. So called because it is not produced by causes and conditions and so is permanent. Also known as ‘uncompounded space’. See Heart of Wisdom. Ushnisha A Buddha’s crown protruberance. One of the thirty-two major signs. Vaibhashika The lower of the two schools of Hinayana tenets. This school does not accept self-cognizers and asserts external objects to be truly existent. See Meaningful to Behold and Ocean of Nectar. Vairochana The manifestation of the aggregate of form of all Buddhas. He has a white-coloured body. Vajra Generally, the Sanskrit word `vajra’ means indestructible like a diamond and powerful like a thunderbolt. In the context of Secret Mantra, it can mean the indivisibility of method and wisdom, omniscient great wisdom, or spontaneous great bliss. It is also the name given to a metal ritual object. See Tantric Grounds and Paths. Vajra and bell A ritual sceptre symbolizing great bliss and a ritual hand-bell symbolizing emptiness. See Guide to Dakini Land and Tantric Grounds and Paths. Vajra body Generally, the channels, drops, and inner winds. More specifically, the pure illusory body. The body of a Buddha is known as the `resultant vajra body’. See Clear Light of Bliss. Vajra brothers/sisters Practitioners who have received any Highest Yoga Tantra empowerment from the same Vajra Master, either at the same time or at different times. See Guide to Dakini Land and Tantric Grounds and Paths. Vajradaka Burning Offering A special purification practice in which our negativities and downfalls are transformed into black sesame seeds, which are offered to Vajradaka who appears from a blazing fire to consume them. 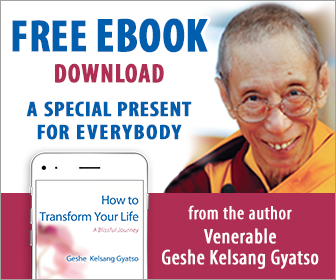 See Guide to Dakini Land and Living Meaningfully, Dying Joyfully. Vajradhara The founder of Vajrayana, or Tantra. He appears directly only to highly realized Bodhisattvas to whom he gives Tantric teachings. To benefit other living beings with less merit, he manifested in the more visible form of Buddha Shakyamuni. He also said that in degenerate times he would appear in an ordinary form as a Spiritual Guide. See Great Treasury of Merit. Vajra-like concentration The last moment of the Mahayana path of meditation. It is the antidote to the very subtle obstructions to omniscience. In the next moment, one attains the Mahayana Path of No More Learning, or Buddhahood. Vajra Master A fully qualified Tantric Spiritual Guide. See Great Treasury of Merit. Vajrapani The embodiment of the power of all the Buddhas. He appears in a wrathful aspect, displaying his power to overcome outer, inner, and secret obstacles. At the time of Buddha Shakyamuni he manifested as a Bodhisattva disciple in order to show Buddha’s disciples how to be perfect Mahayana disciples. Vajra posture The perfect cross-legged posture. See also Seven-point posture of Vairochana. See Joyful Path of Good Fortune. Vajra recitation A mantra recitation produced from inner winds that is practised in conjunction with Vajrayana practices. See Tantric Grounds and Paths. Vajrasattva Buddha Vajrasattva is the aggregate of consciousness of all the Buddhas, appearing in the aspect of a white-coloured Deity specifically in order to purify sentient beings’ negativity. He is the same nature as Buddha Vajradhara, differing only in aspect. The practice of meditation and recitation of Vajrasattva is a very powerful method for purifying our impure mind and actions. See Guide to Dakini Land:. Vajrayana The Secret Mantra vehicle. See also Secret Mantra. See Tantric Grounds and Paths. Vajrayogini A female Highest Yoga Tantra Deity who is the embodiment of indivisible bliss and emptiness. She is the same nature as Heruka. See Guide to Dakini Land. Valid cognizer/mind A cognizer that is non-deceptive with respect to its engaged object. There are two types: inferential valid cognizers and direct valid cognizers. See Heart of Wisdom and Understanding the Mind. Valid mind See Valid cognizer. Vast path The vast path includes all the method practices from the initial cultivation of compassion through to the final attainment of the Form Body of a Buddha. See Joyful Path of Good Fortune and Ocean of Nectar. Vasubhandu A great Indian Buddhist scholar of the fifth century who was converted to the Mahayana by his older brother, Asanga. He wrote Treasury of Abhidharma (Skt. Abhidharmakosha). Vehicle/Spiritual vehicle An exalted awareness that leads to one’s final spiritual destination. See also Path/Spiritual path, Hinayana, Mahayana, and Vajrayana. See Joyful Path of Good Fortune and Tantric Grounds and Paths. View of the transitory collection A type of self-grasping of persons that grasps one’s own I as being an inherently existent I. See Joyful Path of Good Fortune, Ocean of Nectar, and Understanding the Mind. Vinaya Sutras Sutras in which Buddha principally explains the practice of moral discipline, and in particular the Pratimoksha moral discipline. Virtue A phenomenon that functions as a main cause of happiness. It can refer to virtuous minds, virtuous actions, virtuous imprints, or the ultimate virtue of nirvana. See Understanding the Mind. Visual form The object of eye awareness. See Heart of Wisdom. Vow A virtuous determination to abandon particular faults that is generated in conjunction with a traditional ritual. The three sets of vows are the Pratimoksha vows of individual liberation, the Bodhisattva vows, and the Secret Mantra or Tantric vows. See The Bodhisattva Vow and Tantric Grounds and Paths. Wheel of Dharma Buddha gave his teachings in three main phases, which are known as ‘the three turnings of the Wheel of Dharma’. During the first Wheel he taught the four noble truths, during the second he taught the Perfection of Wisdom Sutras and revealed the Madhyamika-Prasangika view, and during the third he taught the Chittamatra view. These teachings were given according to the inclinations and dispositions of his disciples. Buddha’s final view is that of the second Wheel. Dharma is compared to the precious wheel, one of the possessions of a legendary chakravatin king. This wheel could transport the king across great distances in a very short time, and it is said that wherever the precious wheel travelled the king reigned. In a similar way, when Buddha revealed the path to enlightenment he was said to have ‘turned the Wheel of Dharma’ because, wherever these teachings are present, deluded minds are brought under control. Wheel of Life A diagram depicting the twelve dependent-related links and the four noble truths. See Joyful Path of Good Fortune. Wisdom A virtuous, intelligent mind that makes its primary mind realize its object thoroughly. A wisdom is a spiritual path that functions to release our mind from delusions or their imprints. An example of wisdom is the correct view of emptiness. See Heart of Wisdom and Understanding the Mind. Wisdom being An actual Buddha, especially one who is invited to unite with a visualized commitment being. Wishfulfilling jewel A legendary jewel that, like Aladdin’s lamp, grants whatever is wished for. Wrong awareness A cognizer that is mistaken with respect to its engaged, or apprehended, object. See Understanding the Mind. Wrong view An intellectually-formed wrong awareness that denies the existence of an object that it is necessary to understand to attain liberation or enlightenment – for example, denying the existence of enlightened beings, karma, or rebirth. See Joyful Path of Good Fortune. Yama See Lord of Death. Yamantaka A Highest Yoga Tantra Deity who is a wrathful manifestation of Manjushri. Yoga A term used for various spiritual practices that entail maintaining a special view, such as Guru yoga and the yogas of sleeping, rising, and experiencing nectar. ‘Yoga’ also refers to ‘union’, such as the union of tranquil abiding and superior seeing. See Guide to Dakini Land. Yoga Tantra See Four classes of Tantra. Yogic direct perceiver A direct perceiver that realizes a subtle object directly, in dependence upon its uncommon dominant condition, a concentration that is a union of tranquil abiding and superior seeing. See Understanding the Mind. Yogi/Yogini Sanskrit words usually referring to a male or a female meditator who has attained the union of tranquil abiding and superior seeing.